John Kenneth Muir's Reflections on Cult Movies and Classic TV: Saturday Morning TV Blogging: Land of the Lost (1976): "Medusa"
Saturday Morning TV Blogging: Land of the Lost (1976): "Medusa"
Watching the 2010 remake of Clash of the Titans last weekend, I was unexpectedly reminded of my first childhood encounter with the legendary monster called Medusa. That introduction did not come at the movies, actually, with the Ray Harryhausen version of Clash of the Titans in 1981. Rather, I first "discovered" the monstrous Medusa on...Sid & Marty Krofft's Land of the Lost, on October 9, 1976. 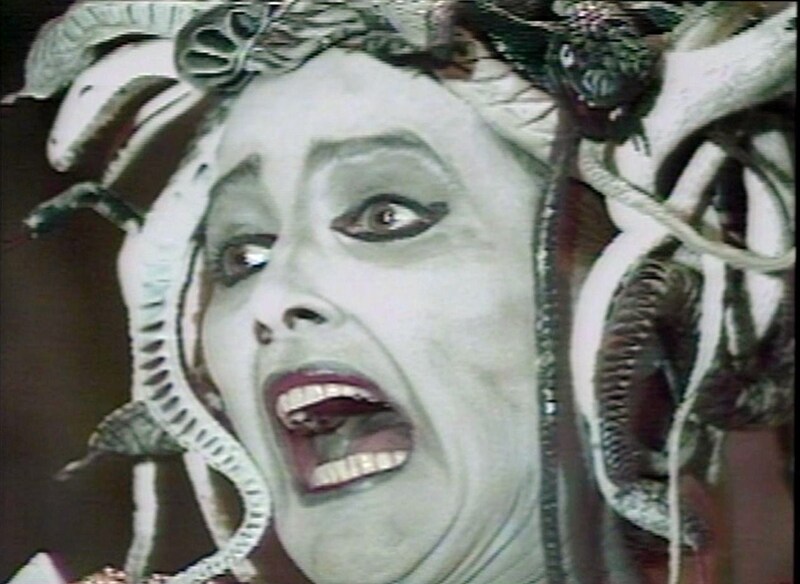 The fifth episode of the third (and final) season of the NBC Saturday morning series highlighted the mythological, snake-haired Gorgon (sister in myth to Euryale and Stheno) as the villain of the week. And indeed, if you are familiar with this bicentennial-era series, it may sound like a real stretch that the Gorgon Medusa would appear in the "closed" pocket-universe of the Land of the Lost. But 1976 was a year of significant format alterations for this childrens' show. Specifically, star Spencer Milligan --playing Dad, Rick Marshall -- left the program, and so did ace story-editor David Gerrold. On screen, Ron Harper (Planet of the Apes) took the lead as Uncle Jack, and behind the scenes, Sam Roeca, a veteran of CBS's animated Valley of the Dinosaurs, came aboard as writer and story editor. Also, writer/producer Jon Kubichan joined up. "The first thing that Sam and I did was watch all the episodes," Kubichan reported when I interviewed him for Filmfax. "I wanted the series to be more fun, and to do something in every episode that was instructive in terms of science." Roeca was on the same page in these desires and shared a mutual enthusiasm for mythology with Kubichan. Together, the new team sought to present in each third season installment "something from the past, from some literature or children's narrative." 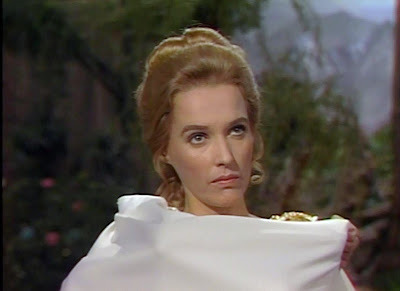 This shift in narrative/imaginative focus resulted in a controversial third season that saw the Marshalls grapple with mythological creatures and beings such as The Flying Dutchman, a unicorn, a fire-breathing dragon, the Yeti...and Medusa. "Medusa wound her way into the Land of the Lost because that actress is my wife," Kubichan joked with me. "A writer that I knew came in, Greg Strangis, and came up with his story. He said, 'How'd you like to do a Medusa story?' and I thought it was a good idea. He went home, worked out a story and I made some changes. He re-wrote a little, and that was that." One reason that humanoid mythological creations like Medusa appeared on the show so frequently in the third season involved matters of schedule and budget. "It was very difficult to do anything with the dinosaurs," Kubichan informed me. "It took a long time to shoot that stuff, so you can't have it done in a couple of days. It takes weeks..."
In "Medusa," Holly (Kathy Coleman), Will (Wesley Eure) and Cha-Ka (Philip Paley) are busy preparing a sort of emergency canoe on the river that the Marshalls explored in first season's "Downstream." Holly boards the craft, and when a dam down-river breaks, end up hurtling away from the others. She is rescued by a mysterious woman named "Meddie" (Marion Thompson), and escorted to Meddie's "Garden of Eternity." There, in the Garden, Holly sees several very life-like statues, including a statue of one Jefferson Davis Collies, the Civil War soldier that Holly encountered with her Dad and Will in the aforementioned "Downstream." Now, this is a really splendid and entirely unexpected bit of continuity in the series; a direct reference to a program two years previous. The statue of Collies is even seen with his beloved cannon, Sarah. After Holly learns that "Meddie" has also turned the land's resident triceratops, Spike, to stone, she begins to suspect that she's in some real trouble. Meddie attempts to entice Holly to stay in the Garden by offering her a new, beautiful dress..
Today, Land of the Lost's dedicated sense of creative imagination and fantasy far outstrips the production's prehistoric special effects, which have not aged gracefully. The series is still incredibly enjoyable (the effects are no worse than Dr. Who's; or Blake's 7, for instance...), but "Medusa" is nonetheless hampered by some poor visualizations. For instance, when "Meddie" turns into the Gorgon, it's clear that the snakes in her hair are just rubbery, inanimate, life-less things. And her "gray," monstrous face make-up doesn't extend fully down her neck. In other words, you can see clearly where the make-up stops and real flesh color begin. But again, Land of the Lost remains a really terrific Saturday morning's kid show because it is so endlessly imaginative, and because all the episodes tend to concern great concepts, whether from science fiction (like time-loops, for instance) or from mythology. Greg Strangis's fantasy story is actually grounded in reality too, and has two very notable themes. In a very real way -- and this is probably why this episode was so frightening to children at the time -- the episode concerns our childhood fear of strangers. Here, Holly is alone and taken in by an apparently kind adult, but one with secret motives. She tries and tries to get away, but the adult is both demanding and apparently friendly simultaneously, and, well, it's hard for kids to go against the wishes of an adult. Here, the stranger is indeed a monster, and Holly must plot her escape carefully. So the story here, in veiled terms, is -- watch out for strangers. The other sub-text in "Medusa" surely concerns vanity. "Meddie" is ultimately undone by her narcissistic obsession with her physical beauty. In other words, according to the teleplay, it is actually "ugly" to be too concerned with one's self. As Holly notes at the end, the problem with vanity is that you might -- like Medusa -- get "trapped" by it. As a six-year old kid, Land of the Lost's "Medusa" terrified me to my core (Kindertrauma alert! Kindertrauma alert! ), but it wasn't just the Gorgon's appearance and frightening ability to turn people to stone that was so powerful; it was the idea that she was a dishonest, untrustworthy adult who was planning to do monstrous things to an innocent child. Yikes...now that's disturbing in a real life way; a way that, well, dinosaurs or Sleestak are not. Today, it's probably hard to conceive that an innocuous Land of the Lost from the disco decade was ever something that was legitimately "scary." But even today, you can detect how the series always attempted to ambitiously present a lot on a very small budget. For instance, "Medusa" features one or two very impressive high angle shots of Medusa's lair. These difficult-to-stage angles get across the atmosphere of danger and dread in a powerful way. A kid's show in a hurry likely wouldn't have found the time to pick out the right angle in moments like these, but Land of the Lost remains powerful (especially to the young-at-heart...) because its stories were conveyed with care both on the page and on the stage. When -- many years after "Medusa" -- I saw Harryhausen's Clash of the Titans, I knew all about what the villainous Gorgon was capable of, thanks to Land of the Lost. But the movie visualization of Medusa was in every way superior and even more terrorizing than what a Saturday Morning kid's show could realistically present. It's a shame that the new movie -- with a big budget and modern computerized-advances -- couldn't actually create a Medusa that was equally troubling to the psyche. sigh...ok, ok...I'll admit it...I am a HUGE Sid and Marty Kroft fan. Everything from PufnStuf to Far Out Space Nuts, to Electra Woman and Dyna Girl!!!! I love the whole mythology surrounding Medusa. With snakes for hair— hated of mortal man—"
According to one myth of Medusa, when she was killed she was pregnant with Posiden's kids, one of which was Pegasus, which would make Clash totally off, but who the heck cares? Disney has Hercules riding Pegasus, so whatever...Greek mythology is a muddled mess at best, but still fun to read. Long live Land of the Lost! I share your love of the worlds of Sid and Marty Krofft. Joel (my 3-year old) and I have begun watching Land of the Lost...but we haven't done any of the scarier episodes, like "Medusa" yet. Just this week, I introduced him to the Sleestak episodes...and he loves 'em! Your comments erased one of my questions on whether or not you introduced Joel to the series yet. I showed my kids the series a few years ago, Season one only, and they really liked it. In fact, they identified with it, getting past those effects, in the same way you and I can still identify with it. Precisely because, as you said, the imagination FAR outstips those effects. How many series can do that? It's an incredible feat. I tell you, when I watched it again for the first time it brought me back, but as you said, the material was so good I still enjoyed seeing it. That's a rare thing today. But what is up with those second and third season changes? I've been watching the box set on Amazon for ages looking to get it inexpensively so I can watch the other two seasons along with the first straight through again. 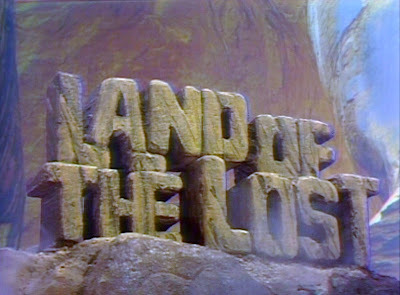 There are shows where the effects are not good and distracting, but somehow, perhaps its the sense of adventure and being there, Land Of The Lost isn't like that at all. It's hard to believe the level of quality that went into that series for a Saturday morning show. It's simply remarkable. Every Saturday morning I woke up, I fed the baby Brontosaurus the big strawberry with Holly, I ran from Sleestaks and I ran to take refuge in that cave with Marshal, Will and Holly getting away from Grumpy and the like by the skin of our teeth. Yes, these were real people we identified with and the family elements along with the spooky, creepy discoveries make it endlessly fascinating to the young and still to me. Again, those CGI effects [Clash Of The Titan] simply don't have the heart and soul of a classic like this. Thank you for a terrific entry and you've geared up my enthusiasm for seeing it all again. I loved your comment. It captured perfectly the beauty of Land of the Lost. So inventive, so smart, so fantastic...and on a shoestring budget too. The second season is very good too, in some ways even more adventurous than the sterling first season. The third season changes -- with the accent on the mythological creatures -- is controversial, and probably for good reason. The first two years sets up a world with very specific, detailed and logical mechanisms (the skylons, the pylons, the pylon express, the "heart" of the Land of the Lost, The Library of Skulls, etc, the closed nature of the universe/sense of ecological balance) and the third season ignores much of that fine detail. There are some fine episodes in the third season, it's just...a different show, a different focus. Medusa shows off the different approach, but it's an episode that has lived in my memory for over thirty years. (Ironically, it aired thirty years to the day before Joel was born...). But Season Two even has its own version of Kubrick's 2001: A Space Odyssey, an episode called "The Musician." It's really amazing...a Saturday morning show, done on the cheap, with the imagination and daring to create something so intellectual and imagination-stirring. Thanks for a great comment -- I'm glad to know your children enjoyed the series too. Joel is over the moon about it, between Sleestaks, the Zarn, "Gravity storms" and "the heartbeat of the Land of the Lost." It's funny, I never watched the 3rd season of LOTL until it was shown on Sci-Fi last year prior to the movie opening. I distinctly remember catching "The Medusa" ep...can totally see where it would be creepy to a little kid. I was a big fan of LOTL at first but sort of "out-grew" it by the 3rd season as I was 13 by then. Watching the re-runs last year, I had forgotten the intracacies of the first 2 seasons. Very sophisticated stuff...I've read online where many think the writers/producers of "Lost" stole (or unconsciously copped) a lot of their ideas from LOTL. Watching Lost, I can totally see how they were inspired by Land of the Lost: an isolated jungle locale, with rules of its own; virtually impossible to escape, with various tribes...and lots of mystery. If you also watch the 1969 show, The New People, you can see the rest of Lost's equation: a plane crashes on an island, and the people aboard have to build a new society! But you are totally right, Land of the Lost is one of those programs that you experience, sort of out-grow and then return to and say...hmmm, this was actually really good. Sophisticated stuff indeed! Medusa is a lot like the 'abominable snowman' also from the third season. Her appearance is so tacky it's laughable. Every kid was familiar with those dime-store rubber snakes (in her hair) just from visiting the toy dept of any store at the time. The abominable snowman was a very poorly fitting 'fur' suit. The show did some wonderful creature makeup (Chaka and the other Pakuni), but the slip in production values during the third season was shocking. I would say that the effects hold up considerably better than 'Doctor Who' or 'Blake's Seven'. The stop motion effects are still cool (the hand puppet 'close-ups' of Grumpy are awful though). Today, the 'chroma-key' effects are often derided as cheesy. Compared to some of the blue-screen effects in films at that time, they're not that bad. 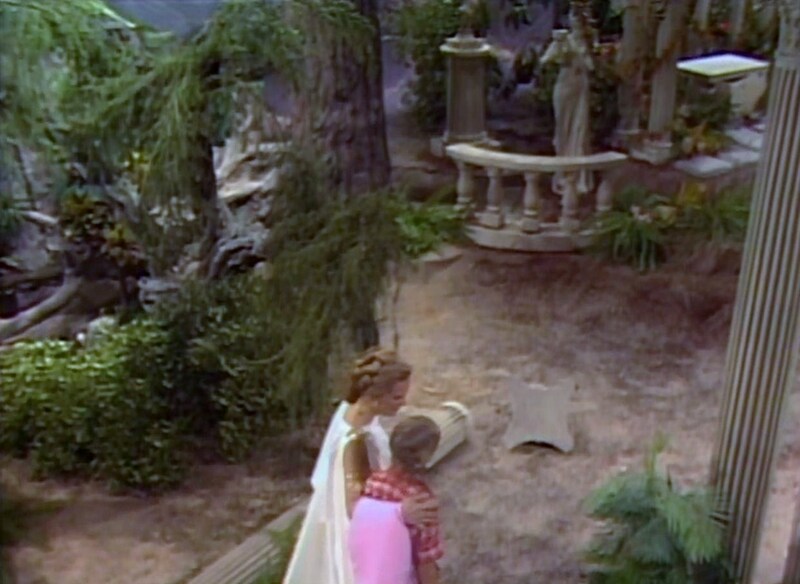 During the second season, in particular, some of the chroma-key composites are almost as good as some of the effects seen in today's shows (such as the end of "Tar Pit" where the characters are placed in front of "big Alice'). As for animated dinos, the third season did feature some great ones. 'Cornered' with the flame-spewing Torchy is one of the great animated gems of the show (along with season one's 'Tag Team' and season two's 'The Test'). A bonus; no hand puppet close-ups of Torchy were used. Didn't mean to carry on about the effects, but was just trying to show some appreciation for the effects in older shows.